Wishing everyone a happy New Year full of positive challenges, new adventures and progress, inner and outer, for ourselves and in our service to the world! Booked to swim the Straits of Gibraltar October 2012 – my motto/mantra being “Swimming to Africa” – and started training after almost a year off from swimming. The swim will be dedicated again to the ideals of the World Harmony Run, but also to the Tegla Loroupe Peace Foundation and The Last Giants – the whales in the Straits of Gibraltar and the efforts of http://www.firmm.org. The first real open water swims this year on the weekend of May 1st and 2nd in 16°C, then 15°C water – just an hour each due to other commitments, with the usual rain the first day and a glimpse of sunshine the next. So nice to swim in clean, cold open water, finally! The swims created quite a sensation with the local early morning walkers looking at me getting in or coming out full of disbelief mixed with admiration, shuddering at the thought of how cold the water must feel. If I had a car I would definitely go there more often, but biking in the rain and cold after swimming feels too dangerous – I have to stay healthy! I had hoped to do 5 hours in a cold outdoor pool beginning May, but the pool in Mannheim is heated this year and the cold Heidelberg pool mostly closed due to the bad weather. So I was looking forward to the Pentecost weekend at the Mondsee (moon lake) in Austria, with plenty of other lakes around. 40 min. Sunday morning before breakfast, 1 hour 30 min (4-5 km) in the afternoon at the end of a beautiful, at times rainy trip with an electrical boat across the whole 10 k wide lake, and another early morning swim by myself of 1 hour 15 or so Monday morning before leaving for home. Two teammates booked for a relay in September were also testing the cold water – and I was relieved when they confirmed the water was not 15°C like the boat rental had measured close to the shore, but more like 12°C. (Swim photos are still in Inessa`s mobile.) I had hoped to be able to swim at least across the lake once for training – but that was out of the question at this temperature for me. 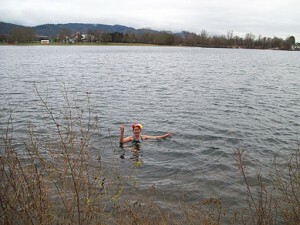 The longest May swim was only three hours (9 km) on the 29th – in 21°C pool water, mostly in the sun, and almost by myself! I stopped when I started to feel weak, luckily, for I had gotten quite a sunburn and was close to a sunstroke, as I realised a little later. When the sun does come out it is quite fierce, and it was the first sunny swim day. June 3rd is a holiday, hoping for a longer swim then. In July it became clear that even if the Channel pilots ran out of swimmers during a period of good weather in September, I would not be able to swim a solo this year. Instead of stepping up my training – at least for a possible last minute Zurich lake spot – I had to reduce. From my computer work (and some games in between) I contracted a painful tendonitis on my right wrist. Olive oil bandages over night helped a little, and swimming for half an hour a day, I felt, helped the healing process, too. But 1 hour or longer swims were out of the question for a few weeks. 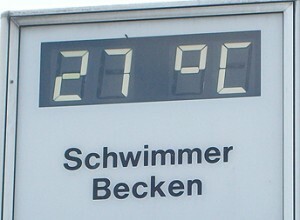 In addition, pool temperatures went up to 27°c. On rain days only the warm pool was open – at 28 °C or more, plus overcrowded. Going to the lake regularly for only a short swim was hardly worth the trouble. The best were half-rainy days, with the regular pool open just in the morning with only a few swimmers. My tendonitis did not even allow me to go to Zurich at the end of July to at least help rowing, and so I did some professional training instead. The next day I heard I could have even gotten a last minute swim slot! What kind of year was this for me??? So I continued following closely how other Channel swimmers were doing via satellite trackers and chat group. 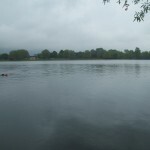 In August, when my wrist had gotten better, I enjoyed a few “longer” swims in the smaller lake in Weinheim, but never doing anything over 2,5 hours. My feeling was, I should soon start training more seriously again for next year, but it seemed hard to really get motivated. At that point I did not expect anything special to happen this year any more.